Family Villa is home to rental property in the Terra Verde vacation resort. Based in Kissimmee, Florida, this home features a comfortable living room with a queen-size sofa bed and a beautiful dining area that seats six. The kitchen is fully equipped, and the property includes a portable crib, high chair, washer/dryer, and PlayStation™ for the kids. 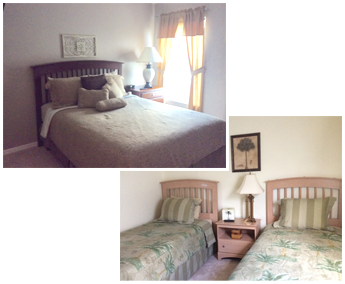 The master suite has a king-size bed, suite two has a queen-size, and the other two bedrooms have twin sizes. This is the perfect vacation home for anyone looking for a rental property that has plenty of room, comfortable amenities, and a great location. It is ideally located near all of the major local attractions, including Disney World™, Epcot Center™, Downtown Disney™, Universal Studios™, golf courses, shopping centers, beaches, and restaurants. It is also about three hours from Miami. The gated community in which the property is located has security as well as concierge services. The resort's amenities include a meeting room, clubhouse, heated community pool, dry sauna, ping-pong area, tennis court, half-court basketball, and a fitness room. Children even have access to a rock-climbing play area. For an extra fee, you can also get a shuttle to Disney World and other attractions.